Great lip balms for a great deal. Really love this set and it comes with cute stickers to decorate! I'm not a teenager or buying for a teenager, but I love these. I have one at my office, one in the car and one in my purse at all times. The stickers just make them a little more fun and make great little gifts for friends! Bought this as a hostess gift for my 27 y.o. daughter (on top of a wine bottle...). She buy these all the time but now she can decorate them and she loves flashy things. Love this holiday pack! Only 1 sheet of the stickers are in colour, the 2nd sheet is just all dark silver but still fun and a great value. I used some of the stickers to decorate my phone case and it's been staying pretty well. Best thing about these is that it's almost organic. Good product. Kids love it. Would buy again. My 12 y/o daughter LOVES these lip balms so I purchased for her stocking stuffer. I love that it's not full of petroleum, parabens and that it's organic. Only the best for my daughter because that's what she deserves. These are perfect stocking stuffers I have a 12 year old that collects them all and trades with friends! I bought this for a gift for a preteen, grown up like but suitable for a young girl. 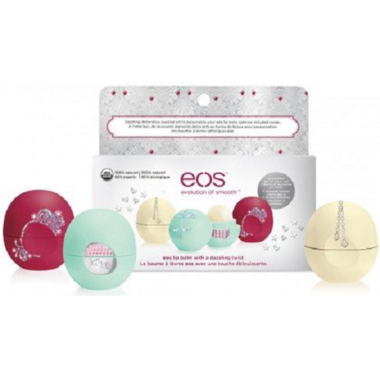 I've always loved the EOS lip balms and always look forward to trying new flavours. These ones are festive and smell amazing! When I purchased the pack, I did not realize that it included pages of stickers, I just assumed the new packaging was already blinged. 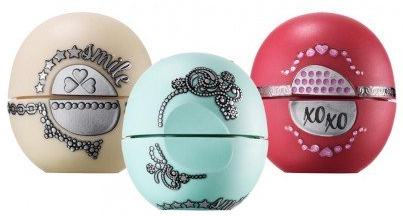 It was so fun to customize my lip balms with fancy stickers! I even had enough to personalize my other EOS lip balms. It's a little thing, but I had so much fun sticking stickers on my lip balms, I felt like a kid again!